Signal is a cloud-based Open Source Intelligence platform, designed to make the job done by corporate security professionals easier and more efficient by saving operational teams time and enabling them to proactively protect. Whilst safety is our core business, public privacy is something we take very seriously. Only publicly available information can be sourced using Signal and we have strict terms ensuring our customers respect the privacy, rights and civil liberties of any person. 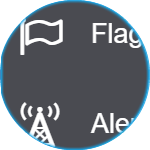 Signal customers must also comply with all applicable laws, rules and regulations in their country. Do a quick search in real time to inform staff at the scene, setup complex boolean searches to monitor at a strategic level or check in historically to actively drive prevention. Get accurate and real time results from online data sources (including blogs and forums) giving you a better view of what's really happening on the ground. An inbuilt audit trail, operational centers and alerts ensures nothing is missed, allowing you or your team the peace of mind you need. Protect key executives and staff at events, offices and stores by using open source intelligence geared to your requirements. Protect students, staff and faculty wellbeing along with university assets through accurate monitoring of campus online activity. Listen to the public to help people at the scene, prevent potential health scares and ultimately save more lives. Signal puts complete control in your hands with it’s real-time live stream service. Play, pause and stop streams to cut through the noise and create live stream groups for effective stream management. Find relevant information originating in a one or more geographical locations to help ensure you get the most accurate information fast. Decide on and filter for your information needs, whether they be location, topic or event specific. Simply build your search filters to begin accessing information. Clearly visualize mission-specific information in list and map formats, ensuring maximum information transfer with minimum effort. Improve the flow and speed of information at strategic, tactical and operational levels. Real time and historic information can be utilized for strategic, tactical and operational decision making, ensuring maximum possible situational awareness. Full screen mode makes it easy to use for centralised monitoring in operation centers. Either dive in deep with advanced boolean search or get the facts fast using a quick search.